Ah, this is one of those movies that comes frustratingly very close to being very good. While Ex Machina has lots working in its favour, though, it feels underdeveloped, and like it’s always just about to fully click into gear, but never quite does. Looking at the previous films that Alex Garland has written, this problem perhaps isn’t a surprising one. Sunshine and Never Let Me Go are both fascinating, low-key sci-fi studies. But while they take a more cerebral approach to the genre, there’s a coldness to them. Those two films are a bit more successful than Ex Machina, however, because of the scale that they operate on; part of the interest comes from the world that their characters are navigating.Ex Machina, which takes place almost entirely in one man’s house and with four characters (one of whom doesn’t talk), feels too removed. The characters are interesting enough, but Garland doesn’t let us see enough into them to completely pull off the “character study” approach. Also, this is Garland’s first time directing. He does a fine job behind the camera, and the film contains many beautiful shots. There is an effectively claustrophobic atmosphere. But another director perhaps would’ve known which threads to tug on to make this story really come alive. The cast here works well. Domhnall Gleeson continues his streak of playing likeable chumps, while Oscar Isaac plays a delightfully bizarre scientist/narcissist type. 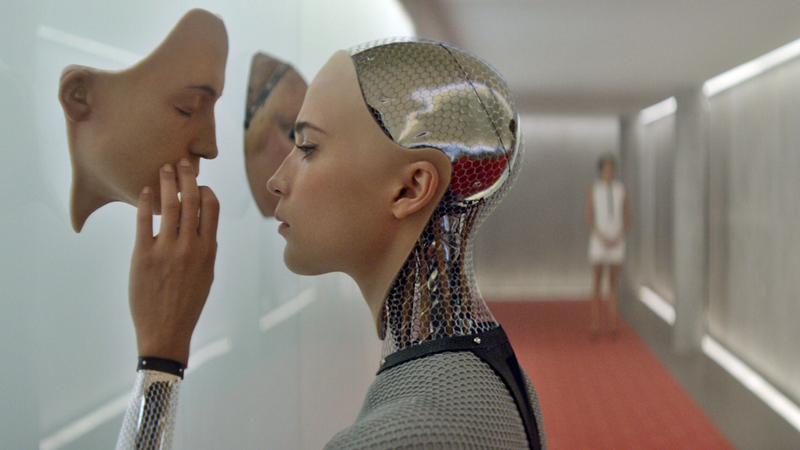 Alicia Vikander, meanwhile, continues her intriguing transition from Sweden to Hollywood, playing a beguiling A.I. creation. However, while all individually good here, the cast didn’t work as well as a unit as I would’ve hoped, given how few characters the movie has. It’s always nice to see a sci-fi movie that takes a less common, more thoughtful approach. Ex Machina comes recommended if you like movies like Gattaca or the aforementioned Never Let Me Go. Though flawed, it’s a promising directorial debut from Garland, and certainly one of the more artful offerings you’ll see at the multiplex this year. This entry was posted in Movie Reviews and tagged Alex Garland, Alicia Vikander, Domhnall Gleeson, Ex Machina, movie reviews, Movies, Oscar Isaac. Bookmark the permalink.